A healthy coral reef at Matabuan. A green turtle swimming into the blue. Divers showing off their flying kicks and back flips. when we found a patch of sand at depth about 8 meters. What is more fun than to take off our fins and do flips and flying kicks? We spent a good time defying gravity and although we consumed a lot of our air, it was still unforgettable. Hunger took over after that dive and so we had lunch on the island. We found a good spot with lots of shade, placed a tarp on the sand and settled down. 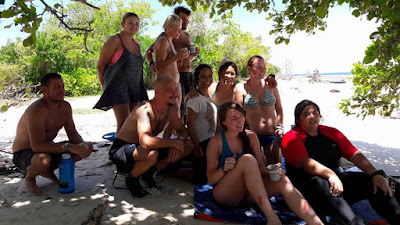 We had some good discussion about what we saw during the dive and played a game of charades. After much laughter, it was time to head back to Pom Pom. Fun day to Matabuan was definitely a day we would never trade for any other days. The dive site, the company of these volunteers, the food, the view and everything else on top of that.